The public’s trust in the federal government continues to be at historically low levels. Only 19% of Americans today say they can trust the government in Washington to do what is right “just about always” (3%) or “most of the time” (16%). Fewer than three-in-ten Americans have expressed trust in the federal government in every major national poll conducted since July 2007 – the longest period of low trust in government in more than 50 years. In 1958, when the American National Election Study first asked this question, 73% said they could trust the government just about always or most of the time. The erosion of public trust in government began in the 1960s. 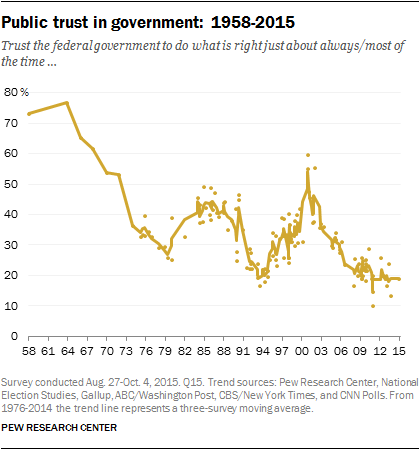 The share saying they could trust the federal government to do the right thing nearly always or most of the time reached an all-time high of 77% in 1964. Within a decade – a period that included the Vietnam War, civil unrest and the Watergate scandal – trust had fallen by more than half, to 36%. By the end of the 1970s, only about a quarter of Americans felt that they could trust the government at least most of the time. 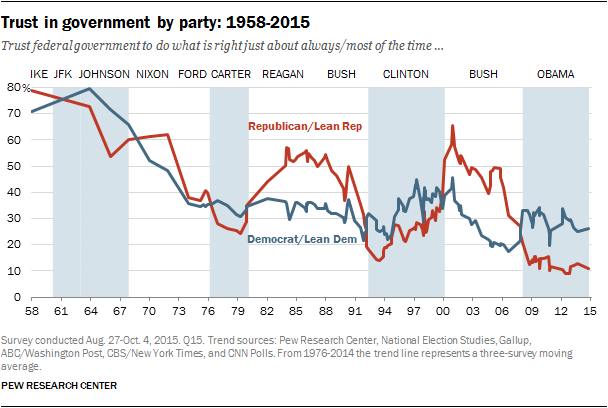 Trust in government rebounded in the 1980s before falling in the early to mid-1990s. But as the economy boomed in the late 1990s, confidence in government increased. And in 2001, the 9/11 terror attacks on the United States transformed public attitudes on a range of issues – including trust in government. In early October 2001, a month after the attacks, 60% said they could trust the government, roughly double the share earlier that year and the highest percentage expressing trust in government in more than 40 years. But the rise in government trust was short-lived – by the summer of 2002, the share saying they could trust the government had tumbled 22 percentage points. Amid the war in Iraq and economic uncertainty at home, trust in government continued to decline. By July 2007, trust had fallen to 24%. Since then, the share saying they can trust the federal government has generally fluctuated in a narrow range, between 20% and 25%. Currently, 26% of Democrats and Democratic leaners say they can trust the federal government nearly always or most of the time, compared with 11% of Republicans and Republican leaners. Since Barack Obama took office in 2009, higher shares of Democrats than Republicans have expressed trust in government. Since the 1970s, trust in government has been consistently higher among members of the party that controls the White House than among the opposition party. However, Republicans are much more reactive than Democrats to changes in political power. Republicans express much higher levels of trust during Republican than during Democratic presidencies, while Democrats’ attitudes tend to be more consistent, regardless of which party controls the White House. During the eight years of George W. Bush’s presidency, 47% of Republicans, on average, said they could trust the federal government just about always or most of the time. During Obama’s presidency, average trust among Republicans has fallen to 13% – by far the lowest level of average trust among either party during any administration dating back to the 1960s. Average trust among Democrats, by contrast, has remained more stable throughout the George W. Bush and Obama years. During the Obama administration, trust among Democrats has averaged 29%, compared with 28% during the Bush administration. Trust in government – among the public overall, and among both Republicans and Democrats – was much higher during Bush’s first term than his second. Among the public, trust on average fell from 43% in Bush’s first term, which included the post-9/11 spike in trust, to 29% in his second. The decline came among both Republicans, whose average trust declined from 54% to 41%, and Democrats (35% to 21%). While the falloff in Republican trust in government between the Bush and Obama administrations has been striking, it continues a pattern that has persisted for decades. During Ronald Reagan’s two terms, an average of 52% of Republicans expressed trust in government, and 43% did so during George H.W. Bush’s single term. This compares with 26% average trust among Republicans during Jimmy Carter’s presidency and 25% during Bill Clinton’s. Average trust among Democrats across all four of these presidencies – Carter’s, Reagan’s, Bush’s and Clinton’s – showed far less variance. In January 2001, following the contentious 2000 presidential election, a CBS/New York Times poll found that only 31% of Americans said they could trust the government just about always or most of the time. In the wake of the 9/11 terrorist attacks eight months later, however, trust rose to 60% among the general public, according to a Gallup poll conducted in early October. This near-doubling from the start of the year crossed party lines: Fully 67% of Republicans and Republican leaners and 51% of Democrats and Democratic leaners said they could trust the government nearly always or most of the time. But this spike in confidence was short-lived. By December 2001, about half of Americans (48%) said they could trust the federal government; trust remained relatively high among Republicans (60%), while falling to 39% among Democrats. In July 2003, as opposition to the Iraq War grew, 36% of the public said they trusted government, according to a CBS/New York Times poll. About half of Republicans (51%) trusted government compared with just 25% of Democrats. As Bush began his second term in 2005, trust in government continued to be deeply divided along partisan lines. 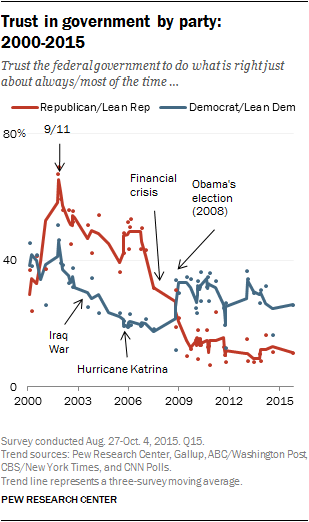 In a Pew Research Center survey conducted in September 2005, shortly after Hurricane Katrina struck the Gulf Coast, 49% of Republicans and just 19% of Democrats said they could trust the federal government. Public trust in the federal government declined, especially among Republicans, during the final years of Bush’s presidency. In January 2007, Republicans were almost twice as likely as Democrats to express trust in the federal government (43% vs. 22%). By October 2008, during the financial crisis, just 19% of Republicans and 12% of Democrats trusted the government to do the right thing. 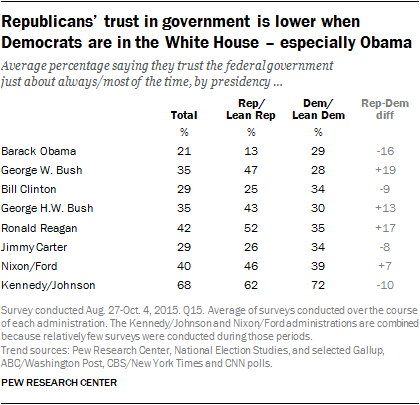 After Obama took office, Republican trust in government – already quite low – sank further. In a Pew Research Center survey in March 2010, amid the contentious debate over the Affordable Care Act, about a third of Democrats (32%) said they could trust the government at least most of the time, compared with just 13% of Republicans. The bitter debate over the debt ceiling in 2011 eroded Democratic trust in government. In a September 2011 CNN survey, just 20% of Democrats and Democratic leaners expressed trust in the federal government. Even fewer Republicans (10%) trusted the federal government. With Obama’s re-election in 2012, Democratic trust in government increased, reaching 37% in January 2013; at that time, just 15% of Republicans had confidence in the federal government. But by October 2013, amid a partial shutdown of the federal government, trust in government had fallen 10 percentage points among Democrats, to 27%, and 5 points among Republicans (to 10%). Since then, trust in government has fluctuated, but the levels of government trust today are about the same as they were in fall 2013: Just 26% of Democrats and 11% of Republicans say they can trust the federal government just about always or most of the time. Trust in government differs only modestly between demographic groups. No more than about a quarter in any group trusts the federal government just about always or most of the time. Young people are somewhat more likely than older adults to say they can trust the federal government. About a quarter of adults younger than 30 (27%) trust the government at least most of the time, compared with 19% of those ages 30 to 49 and 15% of those 50 and older. Whites are slightly less trusting of government – only 15% feel they can always or mostly trust the government – than blacks (23%) or Hispanics (28%). Trust in government among whites is also down from February 2014 when 22% reported largely trusting the government. While Republicans and Republican leaners generally express very little trust in the federal government, trust is especially low among conservative Republicans. Just 9% say they can trust the government always or most of the time, compared with 14% of moderate and liberal Republicans. Among Democrats and Democratic leaners, comparable shares of liberals (28%) and moderates and conservatives (25%) express trust in government. And among all politically engaged Republicans, just 6% say they can trust the government; more than three times as many (22%) volunteer they can “never” trust the government. There are no significant differences among Democrats by level of political engagement. Historically, there have been only modest generational differences in trust in government. Over time, the trajectory of these attitudes has been similar across generations. As noted, young people are slightly more trusting in the federal government than older people. Currently, 25% of Millennials (ages 18-34) say they can trust the federal government just about always or most of the time. That compares with 19% of Gen Xers (35-50), 14% of Boomers (51-69) and 16% of Silents (70-87). 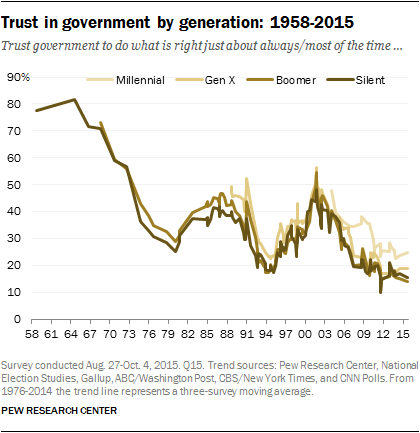 In 2009 and 2010, the differences across generations were somewhat larger: In August 2009, the three-point moving average of trust in the federal government among Millennials was 36%, compared with about 20% across older generations. In the early 1990s, Gen Xers – whose oldest members were then in their early 20s – expressed somewhat greater trust in government than did Boomers and Silents, but these differences have diminished over time. Similarly, there were, at most, small differences in trust between Boomers and Silents in the 1970s and 1980s. Most important, the steep downward slide in trust in government that occurred in the 1970s was seen among both Boomers and Silents. Trust in government often, though not always, moves in parallel with satisfaction in the overall state of the nation. The periods of especially low trust in the federal government – the late 1970s, the early 1990s, and the years since the financial crisis and Great Recession – have also been characterized by relatively low levels of satisfaction with national conditions. 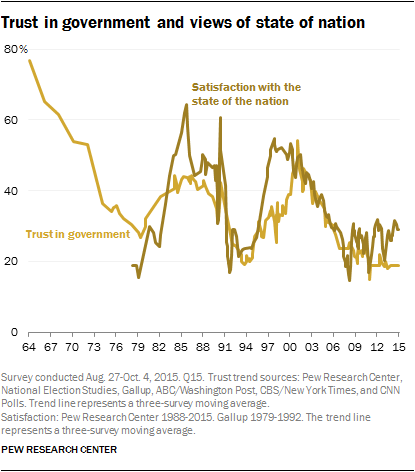 But during recent periods of rapid economic growth, such as the mid-1980s and late 1990s, national satisfaction increased more dramatically than did trust in the federal government. Over the course of the 2000s, the two indicators moved in lockstep. Both reached a high in the aftermath of the 9/11 terror attacks and declined over the next several years. After plunging in October 2013 with the government shutdown, satisfaction in the nation has rebounded somewhat. Currently, slightly more than a quarter of Americans (27%) say they are satisfied in the country. 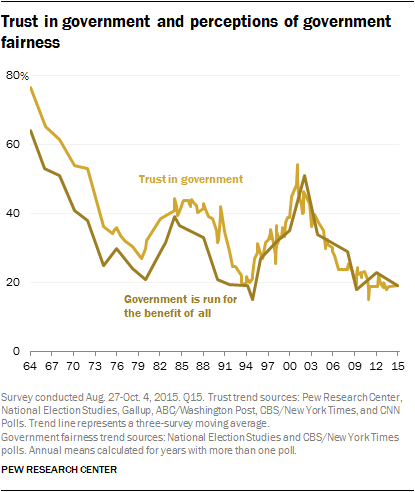 Trust in government has so far lagged behind and remains at historically low levels. The long-term erosion of public trust in the federal government has been mirrored by a steep decline in the belief that the government is run for the benefit of all Americans. At the same time, an overwhelming majority of the public (77%) said they could trust the federal government just about always or most of the time. Yet within a decade, trust had plummeted and the share of Americans who said the government was run for the benefit of all had fallen nearly 40 percentage points – from 64% in 1964 to 25% in 1974. Over the course of the past half-century, the two measures have mapped very closely. Currently, just 19% say the government is run for the benefit of all – and an identical percentage says they can trust the federal government just about always or most of the time.